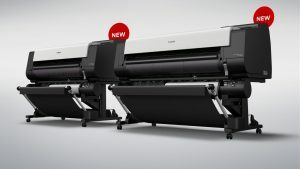 Canon U.S.A., Inc. – Latin America Group is pleased to announce the immediate availability of four new models into the award winning imagePROGRAF line-up: two new 5-color Large-format inkjet printers – the 36” TX-3000 and the 44” TX-4000 models as well as two new Large-format Scan-to-Copy/File/Share/Cloud systems – the TX-3000 MFP T36 and the TX-4000 MFP T36. Positioned as a higher volume solution than the iPF78x Series, the new TX Series was developed to seize the expanding production aqueous inkjet technical documents market. The imagePROGRAF TX Series boasts speeds as fast as 3D sized drawings a minute, stacking of up to 100 sheets, wireless printing capability, automatic roll loading and an optional Multifunction Roll Unit for increased productivity. The TX Series includes two new Scan-to-Copy/File/Share/Cloud systems, the imagePROGRAF TX3000 MFP T36 and imagePROGRAF TX-4000 MFP T36 models which are designed to fit a variety of markets, including architecture, engineering, construction, and office document enlargements. These systems offer an integrated MFP solution that features a new 36-inch scanner that can scan to copy in color in up to 6-inches per second – double the speed of the previous model. In an effort to meet the increasing demands of the production environment, the TX MFP T36 system offers an optional Multifunction Roll System that supports media rolls up to 6.7” in diameter and can scan media 2 mm thick. New enhancements to the SmartWorks software have also made it quicker and easier for you to get the job done. Simply scan a document, mark-up the images on the large touch screen monitor and print. You can even customize the background or change the presets to be the ones that are used most often. With the software and technological advancements made, the TX MFP T36 has advantages the competition cannot match. Give Us a Call at 1 954 252 7460 or Fill out the Form Below to Contact Us. © 2019 CBM Trading. All Right Reserved. Give Us a Call at 1-954-252-7460 or fill out the form below to contact us.